Eleanor & Park is a story about two very different people from two very different backgrounds who find love on the school bus. While it has strong overtones of stories like Pushing the Limits, it also has some very unique elements. It’s set in the 80’s which I’ve never seen done in a modern novel. Eleanor is an overweight, highly insecure girl and Park is half-Korean. You don’t often see minority leads or overweight/non-hot heroines. It was refreshing. I really enjoyed the dual POV in this novel. It was incredible to see how differently these two characters view themselves and each other. The insecurities of each are so raw and make them extremely relateable. The romance between Park and Eleanor is so believable and genuine, you almost forget that it’s not a true story. Miss Rowell captures first love simply and completely. Where this novel fell short was the pacing. The ending felt very rushed while other parts seemed to drag. 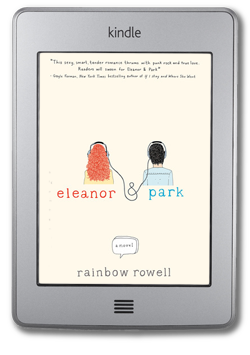 Overall, Eleanor & Park was an enjoyable read. It was unique but also familiar which is a fun combination. Recommended for lovers of Pushing the Limits. Disclaimer: Not recommended for young teens due to language and some mature content. Published: February 26th, 2013 by St. Martin’s Griffin. This seems like such a cute book. 80’s and minority main characters? Sounds awesome. This has been on my list for quite a while now. Can’t wait to read it. Oh I adored Pushing the Limits–will have to check this one out! Great review. I keep hearing the BEST STUFF about this book – I can’t wait to read it now! Awesome review!! I love how you summarized their relationship and the dual narrative…how they view each other/themselves. I love when that’s done right!! I have this one on order. Hope I like it :/ Thanks for the review. Don’t get me wrong, it’s a good book. It just didn’t blow me away. =) Hope you enjoy it!